Traverse City Listed Among "Top 10 Attractions in Switzerland!" Over the years, Traverse City has grown accustomed to being included in glowing accolades and Top 10 Lists around the US. But for the first time, this northern Michigan town has cracked the notoriously competitive European accolade market by being named one of the Top 10 Tourist Attractions in Switzerland. The April 1 issue of Schweizer Scherz magazine congratulated Traverse City for being added to its “Top 10 Sehenswürdigkeiten in der Schweiz” list for 2017. 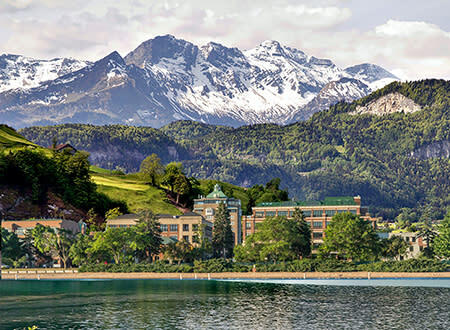 Destinations on the list aren’t ranked, said editor Avril Furst, so the new American entry is given equal weight with such better-known destinations as Lucerne, Chillon Castle and the Rhine Falls. Furst acknowledged that purists may object to the idea of a destination being named to the list even though it’s not actually within the borders of Switzerland, or even remotely close to them. But this, she said, is “a mere technicality” that has been overturned by the emerging science of deconstructionist geography. Tourism officials in Traverse City, meanwhile, are dusting off their old fondue sets to celebrate this latest coup. Trevor Tkach, president and CEO of Traverse City Tourism, said his organization has been working for several years to get the area listed as a European attraction, since it has already been named to most of the U.S. lists. 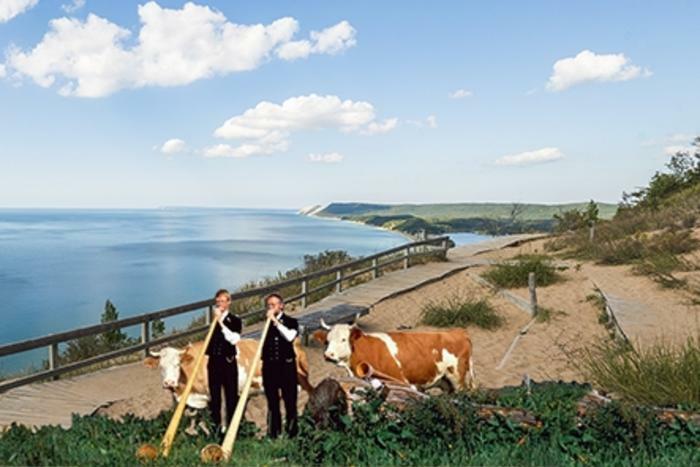 Swiss tourism officials were attracted to Traverse City for the same reasons that have inspired generations of American travelers: its natural scenery, culinary excellence, cultural depth and easygoing Midwestern vibe. And as residents of a land-locked country, they also felt the need to add a "big water" element to their tourism offerings -- especially Traverse City&apos;s long-standing reputation as a center for whale-watching. The situation is slightly complicated by the fact that Switzerland is already home to a region with a similar name. The Val de Travers is a photogenic area in the western corner of the country famed for its watchmaking industry, its scenic inland lakes, and its sparkling white wines. It’s also known for a semi-toxic absinthe schnapps called Grune Fee (Green Fairy), which was illegal for more than 90 years, and a mysterious labyrinth of asphalt mines. In fact, one of its culinary specialties is ham cooked in asphalt. Tkach is undaunted by the prospect of confusion between Michigan’s Grand Traverse region and the Swiss Val de Travers. 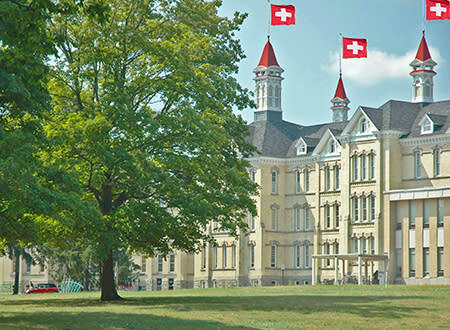 In fact, Traverse City officials are in the planning stages of a new “Swissification” campaign to make the area as Alpine as possible – always taking care not to offend the nearby city of Gaylord, which has been celebrating its own Swiss ties since 1965, with the first Alpenfest celebration. The ambitious plan is based on the strangely successful Mount Trashmore model enacted in the 1970s by the topography-challenged City of Virginia Beach, which created a massive 165-acre city park – complete with two artificial mountains, two lakes, two playgrounds, a skate park, a garden and a series of walkways – out of compacted solid waste. Traverse City&apos;s proposed “Cherry Alps” will be constructed with an eye to their scenic qualities, employing highly photogenic crags and peaks made with recycled material from the dismantled Park Place Dome, and will be located on the south side of Eighth Street. Important note: For more information about the events and persons in this story, please consult the date at the top and the quote in paragraph four.